A court in China has accepted a case filed by Chinese citizens seeking compensation from Japanese firms over forced labour during World War Two. The 37 plaintiffs include lawyers, academics and individuals who say they were forced into labour. They are seeking compensation and an apology printed in newspapers in both countries, Chinese media say. It comes a day after China said it was mulling holidays to mark the Nanjing massacre and Japan's wartime surrender. Ties between China and Japan have recently been strained over a territorial dispute in the East China Sea over islands called Senkaku in Japan and Diaoyu in China. Japan controls the islands. The plaintiffs say that they or their relatives were taken to Japan and forced to work in coal mines during World War II, Japan's Asahi Shimbun newspaper says. 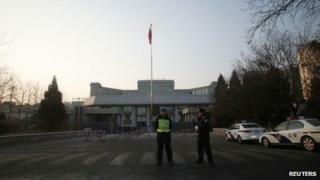 Beijing's No 1 Intermediate People's Court has accepted the lawsuit, Chinese state media report. "Forced recruitment and enslavement of labour was one of the grave crimes Japan committed during its aggressive wars against foreign countries and colonial rule, and is one of historical issues remaining unresolved," Foreign Ministry spokeswoman Hua Chunying said at a regular news briefing. "We believe the Chinese court will handle the case according to law." Zhang Shan, one of the plaintiffs, told China News Service: "As there is no way to get justice in Japan, the Chinese victims of forced labour and their families are determined to sue in China the Japanese companies which did them harm." As China's ruling Communist Party controls the country's justice system, it is seen as likely that having accepted the case, the court will find in favour of the plaintiffs, although any such ruling will be very difficult to enforce outside China, says the BBC's John Sudworth in Shanghai. Japan's Kyodo news agency identified the two companies targeted as Mitsubishi Materials and Nippon Coke and Engineering. Both companies told Kyodo they could not comment on the case because they had not seen the complaint. Meanwhile, top Japanese government spokesman Yoshihide Suga told media that "no outstanding problems exist" in terms of liability following a joint statement in 1972 establishing diplomatic ties between both countries. He said he could not comment on the lawsuit in detail, as it was "a civil suit between the Chinese side and related companies". There have been previous Japan-based lawsuits over forced labour, but almost all have been rejected by the courts. Last year, however, a South Korean court ordered two Japanese companies to compensate families of former forced labourers during Japan's occupation of the Korean peninsula. Mr Suga had said at the time that claims by former forced labourers in South Korea were settled under a 1965 agreement.